David and Sarika Suzuki explore urban innovations leading toward sustainability. for CBC's "The Nature of Things"
Eighty percent of us now live in an urban setting. How we tackle food, land use, energy, housing, and waste issues will determine whether our cities evolve, or decline. 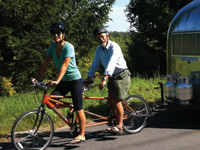 Father and daughter environmentalists, David and Sarika, embark on a cross-country journey of exploration, housed within a compact, "off-the-grid" Airstream trailer. It's a small space with little room for excess or waste, making it a perfect metaphor for an efficient way of living. In Montreal, they discover both large and small operations trying to revolutionize the production and distribution of food in urban settings. In Toronto, they find the "natural world" is included as the city grows. The Edmonton Waste Management Centre is a world leader in recycling and composting - they'll soon be turning waste into biofuel. And Vancouver has found new ways of thinking about energy, transit and housing. "A great film that I thoroughly enjoyed watching. From innovative urban agriculture in Montreal, waterfront redevelopment in Toronto, waste management in Edmonton, to transportation and green buildings in Vancouver, the father-daughter duo showcase how cities are moving towards a more sustainable future. A must see for faculty, students, and others interested in learning more about how our urban environments can be transformed to meet the challenges of the future." "The 21st century will be defined by the world's cities: their rapid growth, their affordability, equity and quality of life, how green and sustainable they become. With Canada as a case study, David and Sarika Suzuki do an impressive job scouting our urban future, uncovering a route at once challenging and bold. The question is, will we follow their lead?" "The quest for urban sustainability is one of the most important and enduring questions of the twenty-first century. This journey through urban Canada offers a timely and unique examination of how Canadian cities are adapting to the pressures of urbanization. Future Cities offers excellent and informative case studies that demonstrate how cities can overcome the limits of urbanization and use density to their advantage. Highly recommended." "This is an ideal DVD for grades 7-12, college, adults, city planners, and those who doubt the possibility of what vision can bring. Bullfrog Films...has another winner in its large chest of visually appealing and stimulating works." "This is a hopeful documentary, full of concrete, positive and much-needed steps towards a sustainable future. Ideal for high school audiences." "Their conversations with engineers, designers, agriculturalists and home-owners are always informative and often intriguing...Classroom use would be entirely appropriate for this film. Students who are learning about urban recycling, agriculture, public transit, green design, or revitalization programs will find many useful interviews and case studies." "An eye-opening glimpse into dedicated efforts to rise to the challenges of the twenty-first century. Highly recommended." "The pioneering ventures highlighted here are impressive, offering a welcome look at what's possible - and what might, at some point, be necessary if cities are to survive. Recommended." Includes scene selection and closed captions. David Suzuki and daughter Sarika travel to Europe to visit inspiring people and projects that give hope for a sustainable future. Inspirational distillation of the life, thoughts and legacy of famed Canadian scientist, broadcaster and activist, David Suzuki. 4-part series that highlights models for urban transformation in the effort to make Chicago, Philadelphia, Los Angeles and Seattle into sustainable cities. Blending seriousness and whimsy, filmmaker Ian Cheney explores the promise and perils of urban farming. A model co-housing project, where future residents participate in the design of their own neighborhood. David Suzuki reports on a wide range of green buildings, from large community developments to mini-homes. The story of Boston's first LEED-certified residential green building, and the people who made it possible. A community garden grows community as well as food, flowers and consciousness.